They are one … but not necessarily the same. Hubby dresses up for his “day” job. Pig-farmer wears the rattiest clothes known to man. The above-pictured overalls are in mint condition. Truly. He RRrriippssss the tops of sacks off and throws the string and tops to the side. Maybe it is because I can’t physically rip the bag tops off, but I painstakingly find the magic string end that, when pulled, if there are no hitches, will “unzip” the bag. Then, I put the sack tops and string into the trash. Oh the baling twine! A huge peeve of mine. Twine twists and wraps itself around the barnyard. If left on it’s own, the twine becomes entangled in every fence, nook and cranny. It hides in the grass … and then the mower EATS it. Or tries to. Instead, the twine wraps around the mower bearings causing major issues. When I am doing chores, I usually spend several minutes just returning items to where they belong, gathering trash and recyclables, and collecting coffee mugs/iced tea glasses for washing. You think I might be exaggerating? Nope. Just pig-farmer doing a little painting of the barns. That’s a paint brush, not a knife. I know. I get messy, too. Some splatters and drips…sure. But, mercy me! 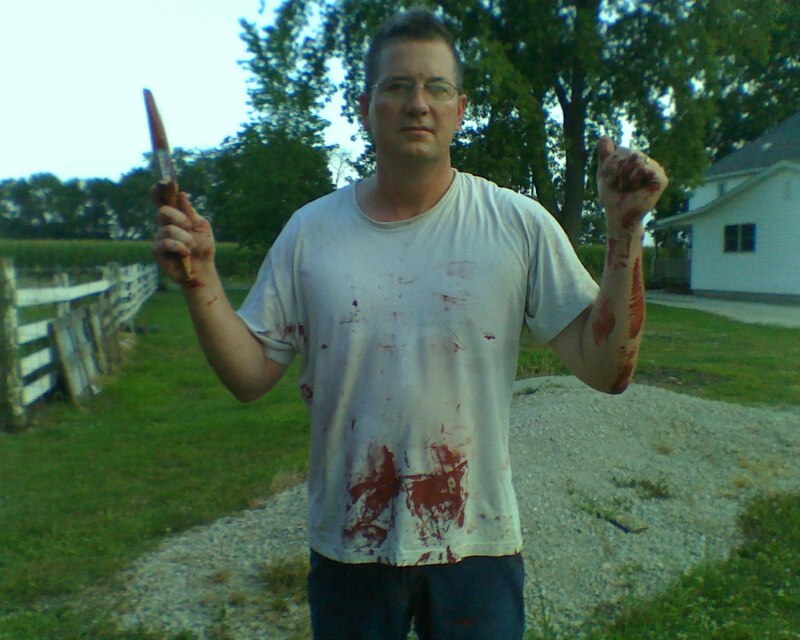 And then, let me just tell ya about the time pig-farmer had a bad bout with the, uhm, well, let’s see. What should I call it? How about a violent, relentless, emptying and cleansing of the lower intestines? 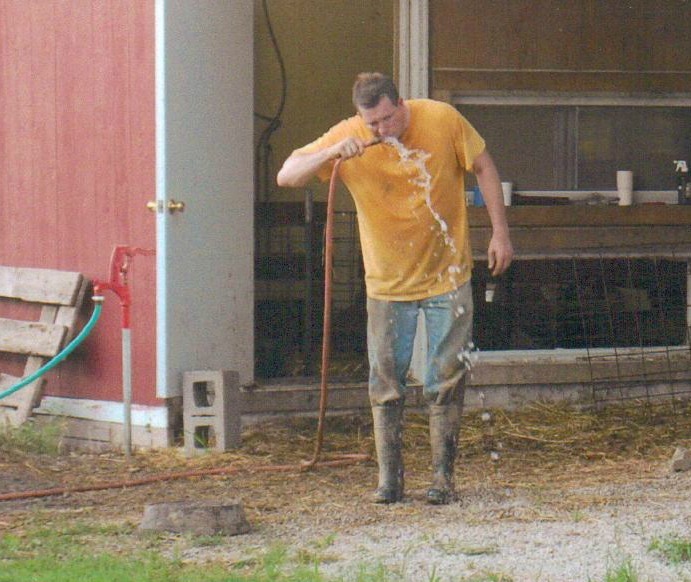 We told him it was because he drinks from the hose in the summer …. the hose that has been lying on the ground. The sometimes muddy (and Lordy knows what else) ground. He was sure that was not it. He said he didn’t touch the hose with his mouth. Well, lo and behold, a good friend CAUGHT him in the act! I’ll just say a picture is worth a thousand words. 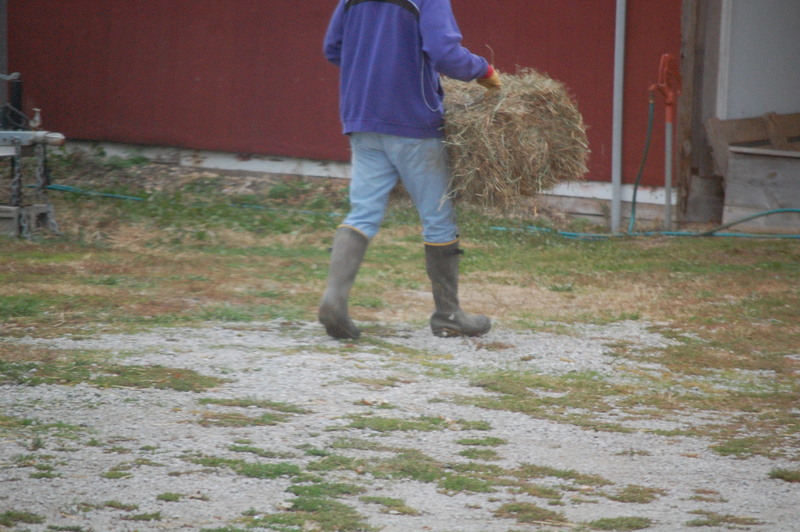 And if that picture doesn’t say it clearly enough, I will add that there are piggies in that barn behind him. Very, very, very close to where that hose was lying. Then again, there is that cute side. Look closely at that adorable 4-Her’s shirt. He was a prize-winner, too!! 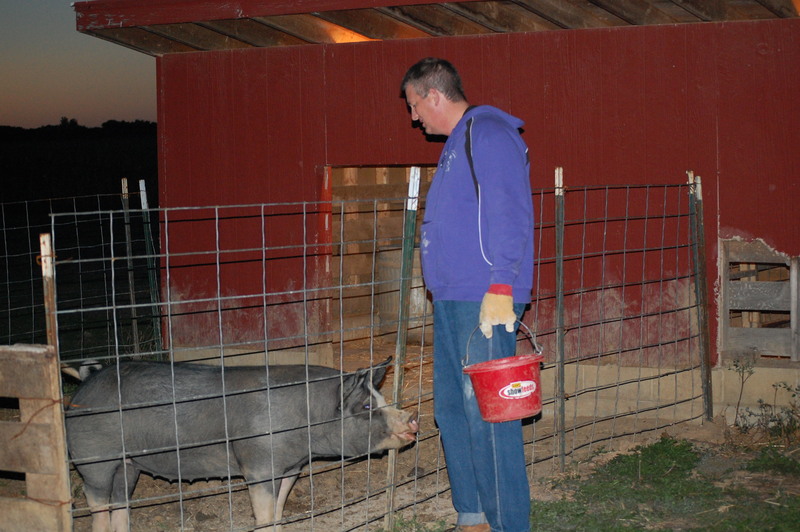 This entry was posted in Berkshire Pigs, Country Living, Friends and Family and tagged 4-H, chores, Country life, Pig-farmer, pigs. Bookmark the permalink. I love this true and accurate description of the guy known as “Pig Farmer”. As a fellow member of his mens group that meets every Saturday morning, I would like to propose adding “Bible Reader” to his nickname. Perhaps we can refer to him as the “Bible Reading Pig Farmer”, or “BRPF” for short. Maybe we could add a vowel to the acronym making it “BRuPF” to make it easier to say and remember. Livestrong Mr. BRuPF! I think that acronym is perfect! Very fitting. I am thankful your quick camera work caught the water hose incident so that my cooking is free from blame of causing any intestinal distress! How dare the Pig Farmer say your cooking gave him intestinal distress? At least pictures don’t lie. So glad to meet him and to learn the truth of his obsession with all things pig. i totally enjoyed it! 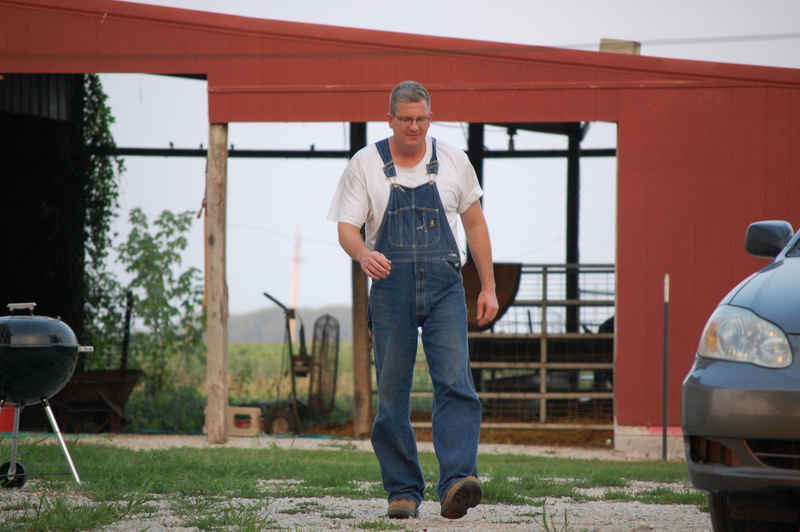 Pig-farmer is on the road tonight for work … wondering what he is going to say! I’m glad you enjoyed it … he really has two sides!! Cute post! I grew up beside a pig farm, so your post came complete with “smell-a-vision” for me! Oh, and we had a dairy barn across the highway……Peee-u-eeee! Oh my – you grew up with all the sights, sounds and smells! I hope we never have so many pigs that the smell is a major issue. He sounds like a man of focused passion. You are both a lovely, handsome couple but the overalls made my day! He’s the second person I’ve seen in overalls. The other was my uncle – what a character. I’d leave all those feed bags all over the barn, let them blow out in the field and let HIM get off his tractor and pick them up. Why should he pick them up when he knows YOU will. He must be “re-learnt.” It’s a wonder he doesn’t have intestinal parasites with that hose trick of his. I just don’t understand the pig passion, tho. What’s to like about a pig? You are sweet & funny. I think overalls are worn by characters! I have been trying to “relearn” him … then I get tired of nagging. He travels so much with his work, that I can’t stand to let some of the messes develop into problems while he is away. The baby pigs are really cute … maybe his passion has more to do with the end result – bacon! Always nice to have a face with a name! I’m trying to locate feeder pigs in ND, I think I will have some for May. This will be a first since growing up as a kid. So how do you guys fence, and what keeps them in? I hear this can be a challenge. I would love a post on the basics of keeping pigs, if you have the time. Have a lovely weekend. Thanks for all the smiles you bring. I don’t quite get the messy-factor (and I’ve raised two sons!). LOL! I try to laugh (as much as possible) to keep from getting too irritated, too often. We have reasonably good luck fencing with hog panels. You could also try a low electric fence inside an existing fence (especially if the existing fence isn’t “pig tight.” I’ll have to ask Pig-farmer for the tips! Maybe he should write that post! I’m glad you enjoy the blog. Hope your weekend is happy! It was nice to meet Pig Farmer. I would love more pointers on raising pigs for meat. Was going to do that this year but I’ve got too many things going on. Hopefully next year though. I will enlist the help of Pig Farmer for some pointers. Are you interested in purchasing the young, feeder pigs or the whole birthing/farrowing process? no I’m just going to start with a feeder pig. Great! That is what another reader is interested in, also. Soon, we will have the farrowing process to blog about – as they grow (hoping for none of that porcine diarrhea epidemic to hit our farm and kill the piglets), you should be able to pick up some info. I’ll try to remember for pig-farmer to tell me the appropriate age for selling as feeders (20 lbs, I think, maybe? ), and I’ll make note in the blog that they have attained feeder pig status. lol. thanks! I appreciate that very much. 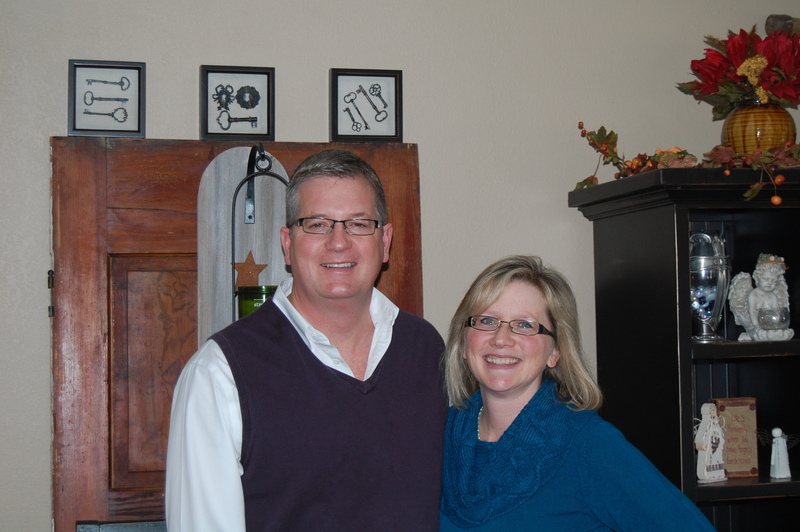 When I first met my husband he was a pig farmer. I still like him best in his overalls!